If you read the word ‘volcano’ and then close your eyes, what do you see? Chances are you picture a cone-shaped mountain with a hole at the top, right? Filled with a sea of glowing red lava? 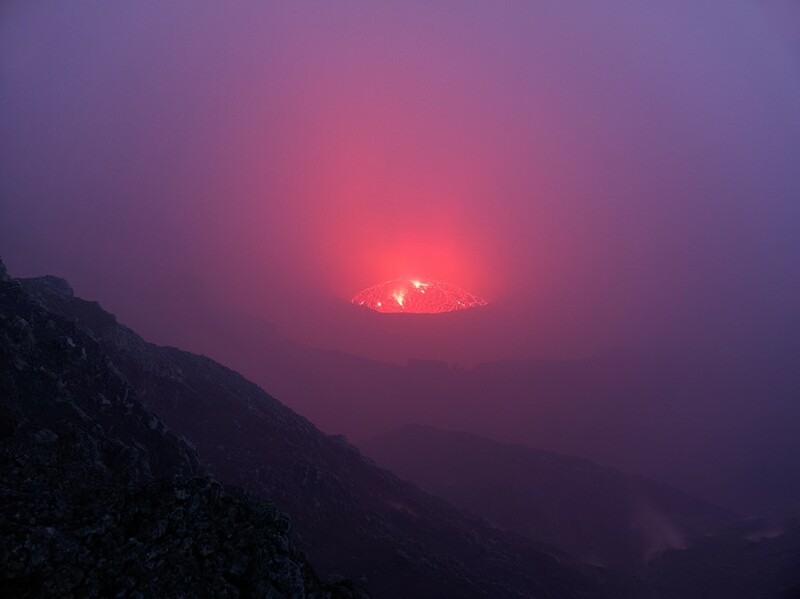 When you open your eyes at the top of Mount Nyiragongo, that’s exactly what you see. 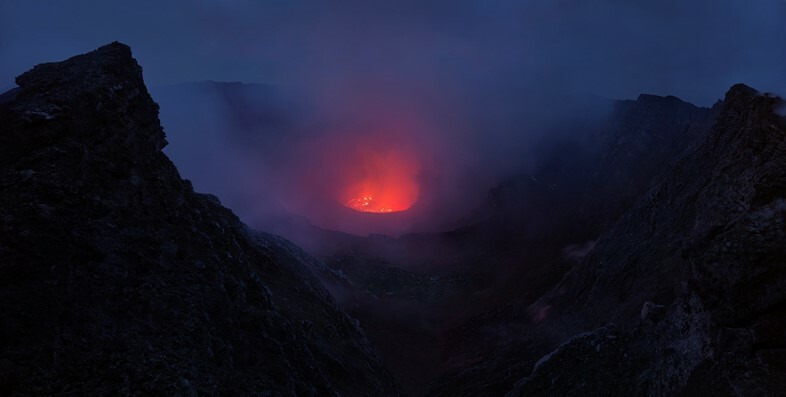 A postcard-perfect poster child for its race, the volcano rises more than eleven thousand feet above the montane forests on the Eastern edge of the Democratic Republic of the Congo, shrouded by mist and hidden by cloud. 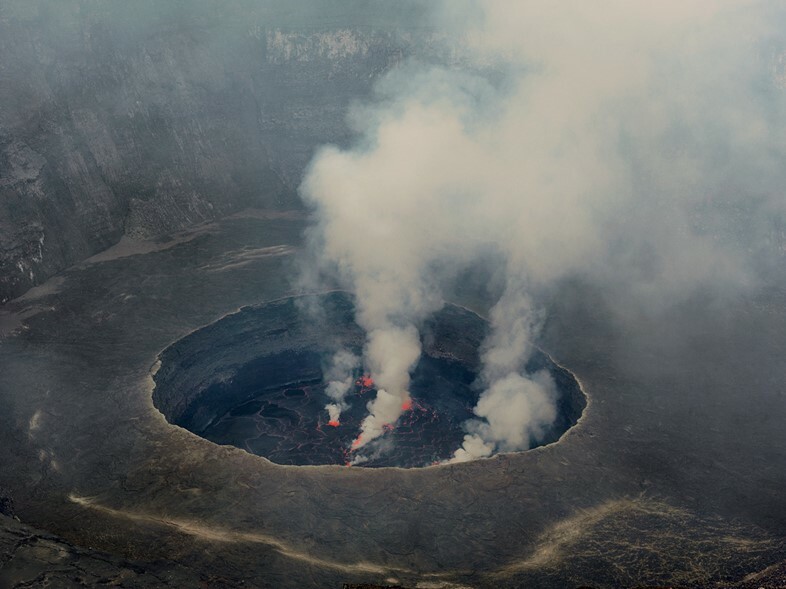 A day’s climb from the forests above Goma, Nyiragongo cradles one of the world’s largest and most consistent lava lakes within its caldera – a perfect circle of fire hidden high above Africa. Photographer Klaus Thymann recently trekked to the crater’s edge and beyond to capture these incredible images. Nyiragongo and neighbouring Nyamuragira lie along the Albertine Rift, an offshoot of the Great Rift Valley that defines East Africa and was home to the earliest known humans. The two volcanoes and numerous smaller ones nearby are likely above a hot spot, where a plume of magma rises towards the surface. This makes them particularly active – and deadly. In 1977, Nyiragongo’s crater fractured – sending lava cascading down its steep slopes and killing at least 70 people. More recently, in 2002, a fissure opened up in the volcano and lava spread into Goma. 147 people were killed by falling buildings and release of deadly, air-displacing carbon dioxide – an ongoing threat around the volcano. 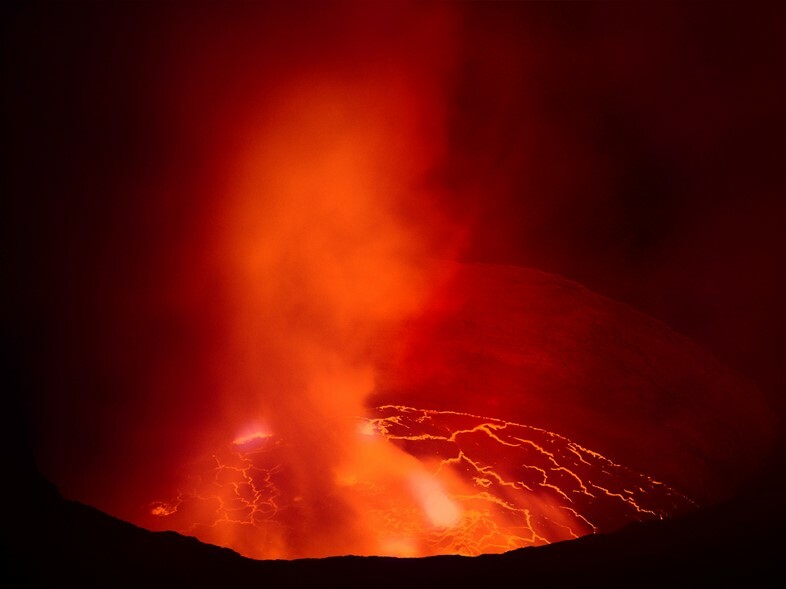 The lava lake at Nyiragongo is formed and maintained by the constant motion of the two types of magma found in the volcano – which have ridiculously long descriptions like “olivine melilitite formed by partial melting at the base of the lithosphere within the dolomite-amphibolite-garnet stability field.” Essentially, molten rock wells up from the heart of the volcano’s magma chamber, cools, cracks and churns because of the heat. And if you’re wondering, ‘magma’ is just the term for lava that’s still underground. Until 2008, Virunga National Park was in a sorry state, ravaged by the years of conflict which have riven this most unfortunate of central African states. Today, the situation has improved drastically and the park is relatively safe. It’s possible to travel from Uganda or within the DRC, but the easiest way to get there is to fly into Kigali International Airport in Rwanda and take a 3-hour taxi ride to the border. A Nyiragongo Volcano Trek Permit costs $200USD and enables you to spend a night in the cabins near the crater, watching the lava lake as the sun sets and rises. Click here for more information. Timezone by Klaus Thymann, in partnership with Casio G-Shock, is at The Supermarket, New York, until April 9.